2 Where are the sources? It says: "relatively weak United Kingdom." This would be incorrect, considering it still owned the world's largest empire, ever, at or around its peak at the start of the war. Britain had a large Empire, but like a modern Monarch it had little power. Canada's alligence ot Britain is to their credit as they could have stayed out. India and Australia had little choice as they were involved by the war in Asia. Most of the remaining British possessions were in southern and eastern Africa will less direct involvement. I don't believe that there was ever any expectation that Britain would not remain in the war. Hitler and his generals understood that Fortress Europa would not be tenable without the conquering of Britain. If you have information to the contrary, I would like to see a cite about it. Germany and the Soviet Union never had any sort of alliance. RobS, where did you get the expression "frisch, froelich krieg" from? You used more than once, but I have never encountered this phrase anywhere else before. It reminds me of the mood at the beginning of WWI, but not exactly of WWII. If you have a source for this expression, I'd be more than grateful. User:Order June 7. Hitler viewed it basically as a propoaganda campaign. He wrote a whole chapter on propaganda in Mien Kampf, marvelling and admiring how effective British propaganda, without bullets, was in WWI. This was given high priority in Nazi Germany, Goebbels Ministry was built on, and modeled after British propaganda (state run BBC). Hitler could never understand why Britain didn't make common-cause with Germany against the USSR, always couldn't understand what they expected to gain. Many Brits as well, never thought the War was worth the effort expended, during it and after. And Britain had absolutely nothing to gain, and everything to loose. In fact, while being a victor, they lost everything, i.e. the British Empire. This brings us to a discusssion of the Arsenal of Democracy, and Churchill's "give us the tools, and we'll finish the job" speech. In 1940, the US was adament about remaining neutral. The Arsenal of Democracy, for US domestic consumption, meant the US would get invovled in building weapons, but not supply manpower, i.e. bloodshed. This was extremely controversial at the time. Churchill's speech was intended as a reassurance, if the US would amend the Neutrality Act, and allow Lend Lease shipments, Britain had the manpower (which survived Dunkirk), but only needed the tools (weapons) from American factories (the Arsenal of Democracy). This was the propaganda sold to the American public, that the US could take sides, arm Britain, yet not expend any manpower or bloodshed of its own. Hitler evidently believed it as well, never thinking American troops would assemble in Great Britain to invade someday. Or if it did happen, it would take years and years to build the ships, ship the material and manpower, and finally mount an invasion. Um...in 1943 Churchill himself visited Lisbon...not a place to be if it is pro-German. That is well over a year before the war finished and before an Allied Victory was assured. Before the Americans came in, Portugal had given the Allies "use" of their Atlantic islands. I am not sure what you are getting at. These pro-English gestures, and others were not "once the war was over". Yes that's all true. I don't recall all the details how the Allies got to use the Azores, but after Stalingrad, virtually everybody in the know knew which way the wind was blowing and who was going to win anyway. Besides, the Germans never had sufficient naval forces to hold the Azores, the only interesting question would be was it before Stalingrad or after? and if before, what impact did it have in facilitating transport of troops & material for the North African campaign, and to what extend was Allied occupation of the Azores visiable (by visable, I mean that the Germans knew it was done with the consent of Protugal, OTOH, was it forcible in that Portugal was powerless to prevent it) so the Germans basically knew Portugal was abetting the Allies. You are no doubt right again. I am looking at books I have hardly opened in 40 years! In a memo from "Prime Minister to Foreign Office" dated 11 Aug. '41, discussing talks with Roosevelt on the Atlantic Charter he writes (inter alia): ".....he (Roosevelt) would be willing to come to the aid of Portugal in the Atlantic islands...." (My italics) This implies Portugal desiring that aid. This is after the invasion of Russia but well before the rot set in. When I was looking for some information about the German opinions about Britain staying in the war, I found an interesting discussion about a book by Lidell Hart. He interviewed some of the German generals at Nurenburg. 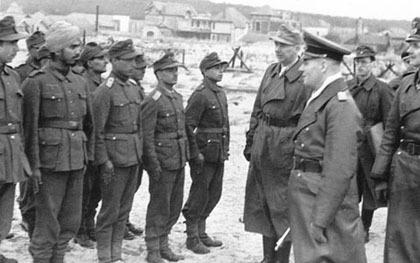 Several of them said that Hitler held the Germans back at Dunkirk, when the generals wanted to move in and finish off the Expeditionary Force. According to them, Hitler thought that, with France defeated, Britain might be willing to join with Germany against Russia. While these were comments made well after the fact, BLH points out that when awaiting trial, it would make more sense for the generals to put themselves in the position of saving the British troops, instead of giving that role to Hitler. I know that before the war broke out, there was a small group of Britons that supported the idea of fascism being preferable to communism. I wonder if Hitler, who clearly had agents in pre-war Britain, made a complete misread of this position. Liddell Hart is the primary source we should be using for this article. And yes, Hitler never reconciled in his mind why the English, racial cousins, would not join in the fight against Soviet Bolshevism. (In fact, there was an SS legion made up of Englishmen, the Legion of St. George, had about 50 English speaking Brits who fought in Russsia). "The immediate causes of World War II are generally held to be the Japanese attacks on China, the United States..."
What? How is the Japanese attack on the United States an immediate cause of WWII? Is this some kind of joke? According to the insular American view, WW2 only happened because Pearl Harbor was bombed. Although remember they hid for 2 years, 3 months & 4 days from the original start of war, and were more than happy to appease Nazi Germany even after 7th December. Despite the sinking of the Reuben Jones the US never wanted war with Hitler. It was Hitler who declared war on the USA. Perhpas we need to develop a larger outline for the war. What appears here, is larely what can be referred to as the untied front, i.e. it only discusses the united front against axis powers, and moreless ignores the Soviet invasions of Poland, Finland, the Baltic States, etc. No discussion of the Soviet-Japanese front, Moaist and Comintern activities in the Far East, etc. It seems you have no information on Australia during WW2, this is quite dissapointing seeing as Australia comitted around 300 thousand troops to the war and at one stage held 1/3 of the line in europe against nazi germany, they also fought in africa against italy, as well as in the pacific against japan. Where was the information about the battle for PNG where 800 australian soldiers defeated 10 000 japanese? The article states that Finland was invaded, which is a bit misleading. Soviet troops were never stationed on Finnish ground permanently, and Finland retained sovereignity. Finland gave up 10% of it's land area, yes, but was never invaded by Soviets. Please consider checking the facts before posting unfounded information. Respectful enough? Fine, I deleted the 'blatant lie' part. But hey, the schools in Finland never taught us that we were invaded - because we weren't. Please remove that bit of information and refer to some history book for correction - I'm sorry, but I think the quality can be improved, and should be improved. I am deleting a paragraph claiming that the number of Soviet fatalities during the years of the so-called Great Patriotic War is less than the number Stalin had been causing per year by his horrendous treatment of the Soviet (generally Ukrainian) people during the years leading up to the conflict. I had always thought a figure of between 24 and 27 million was correct and the following sites confirm that. Evading the fact that there would not have been a Second World War without the Nazi-Soviet pact, it is often claimed that the Great Patriotic War represented a massive sacrifice by the "Motherland" in terms of loss of life. This is not true. In fact, during the five years from 1941 through 1945 -- including the period when the Soviet Union was at war with Germany -- Soviet deaths (including deaths from natural causes) totaled some 8.4 million, or about 1.7 million deaths per year. By comparison, during the ten years from 1931 through 1940, the Soviets suffered some 21.7 million deaths, or about 2.2 million deaths per year. So annual Soviet deaths during World War II were about half a million less than during the preceding decade of peace. Far from costing millions of Soviet deaths, WWII actually saved a net of about 2.5 million Soviet lives over five years, by forcing Stalin to ease up on the mass murder of his own people. ↑ Kazuhiro Kumo, Takako Morinaga, and Yoshisada Shida (2007), "Long-Term Population Statistics for Russia, 1867-2002," Table 1, pp. 33-34. Here's the concluding hour of a 3 hour film. The point is, you don't need subtitles or anything to understand what this film conveys (the original has various dialogue in Chinese, Japanese, German, French, English, etc.). The Chinese today are frustrated that their story of WWII is not known to Americans', and that Japan unlike Germany has never apologized or attempted restitution with its neighbors. This is a sticking point in US-Chinese relations today, the fact that the US is so friendly with Japan, has rebuilt Japan into a powerhouse, and has assumed Japan's defense. China still regards Japan as hostile. And for the US to ever have better relations with China, every Anerican man, woman, and child has to understand what China endured. When I first saw this film, I came away thinking the Japanese were worse than Nazis or the Red Army, if that's possible. John Rabe presents "a great moral paradox." He was a Nazi party member who is revered in China as a great humanitarian who saved 250,000 lives. This page was last modified on 16 January 2019, at 04:30.